Physicians and officials at Children’s National Medical Center, including the Sheikh Zayed Institute for Pediatric Surgical Innovation, hosted a delegation of senior health officials from the United Arab Emirates on Wednesday. Led by His Excellency Dr. Hanif Hassan Ali Al Qassimi, minister of health for the UAE, the group discussed the latest trends and practices in pediatrics and opportunities to collaborate to benefit children in the United States, the UAE, and worldwide. Other delegation members were His Excellency Nasser Al Budoor, Director of International Relations and Health Affairs and Director of the Health Minister’s Office; Dr, Nariman Al Mulla, advisor to the UAE Minister of Health and chairwoman of the Federal Health Authority Steering Committee; Dr. Yasser Al Nuaimi, Director of the Department of Curative Medicine at the UAE Ministry of Health and Director of Clinical Education at Ras Al Khaimah Medical District; and Dr. Yousif Al Serkal, Acting Director of the Al-Kuwait Hospital in Sharjah and Head of Gastroenterology. Dr. Gerard Martin, senior vice president in the Center for Heart, Lung, and Kidney Disease, and Dr. Craig Sable discussed congenital heart disease and its impact on both children and adults. 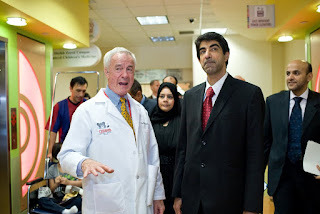 They also demonstrated the technology in a state-of-the-art media room, which allowed them to observe a live surgery and talk with a doctor in Morocco via videoconference. Obesity was also a major topic of discussion, as it is an increasingly serious problem both in the United States and the Middle East. 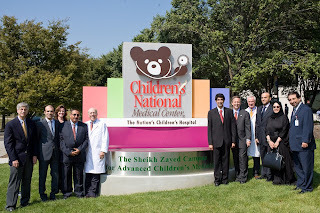 Dr. Kurt Newman introduced several members of his “dream team” at the Sheikh Zayed Institute – Dr. Anthony Sandler, Dr. Raymond Sze, Dr. Julia Finkel, Dr. Craig Peters, Dr. Timothy Kane, Dr. Nabile Safdar, and Dr. Larry Mahan – who shared their gratitude for the generosity of the Government of Abu Dhabi and the people of the United Arab Emirates whose historic gift has made their work possible. Dr. Mark Batshaw described the integrated approach Children’s National takes to research – applying discoveries as quickly as possible since research is conducted in the same building where care is provided. 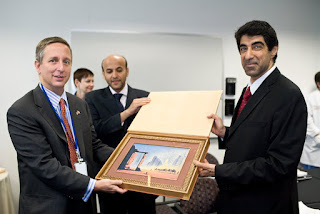 The delegation also met with James Lintott, Chairman of the Board; Pam King Sams, executive vice president for development; and Oussama Elbaba, Director of the International Program at Children’s National.